Reviewing some of the physical characteristic techniques he utilizes, Wallace explained how his research group applies them to high-mobility electronic materials, like the arsenides and nitrides, for example. The latter half of the lecture focused on his more recent work with 2-D materials and interfaces. IMR brings world-renowned materials researchers to the Ohio State campus each year through its Distinguished Lecturer Series to share the latest developments in materials-allied fields and discuss their research with the Ohio State community. 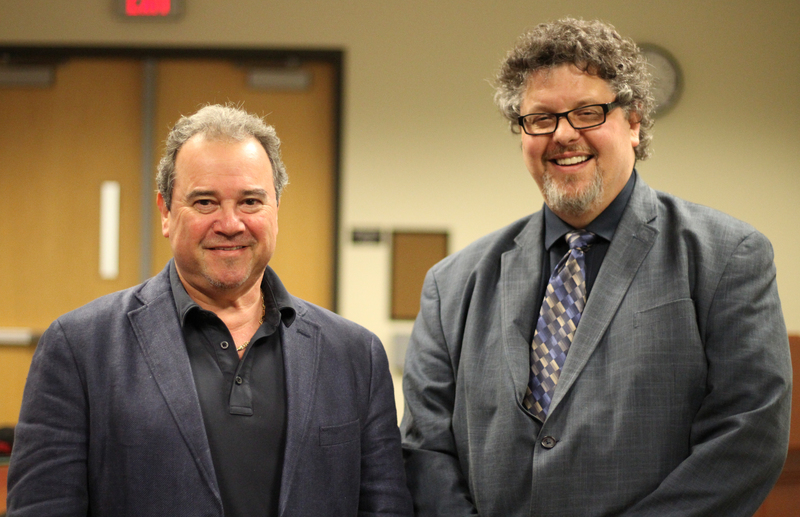 IMR executive director Steven Ringel (left) and UT Dallas professor Robert Wallace. Several attending graduate students from the College of Engineering said they found Wallace’s discussion interesting and potentially applicable to fields specific to their interests outside materials science. “I thought he did a really nice job of placing his work within the historical context of a rapidly evolving field,” said Daniel Lepkowski, a graduate student in the Department of Electrical and Computer Engineering whose research focuses on improving performance of next-generation photovoltaics. Wallace co-authored a review of high-k gate dielectrics, published in the Journal of Applied Physics, that is recognized by the Semiconductor Research Corporation as being among the most influential research publications in that field. The review has about 5,000 citations, according to the Science Citation Index, making it one of the most cited publications in the Journal of Applied Physics. It is also ranked in the top 45 cited publications of the past 85 years by the American Institute of Physics. He is the author or co-author of more than 380 publications in peer-reviewed journals and proceedings, with more 20,000 citations, according to the Wallace Group at UT Dallas. Wallace received his Bachelor of Science in Physics and Applied Mathematics from the University of Pittsburgh in 1982. There, he went on to earn a Master in Science and, in 1988, earned a doctorate in Physics, while studying under professor W. J. Choyke. Wallace then spent two years as a postdoctoral research associate in the Department of Chemistry at the Pittsburgh Surface Science Center. Wallace was named AVS Fellow of Society in 2007 and elected to the grade of IEEE Fellow in 2009 for his contributions to the field of high-k dielectrics in integrated circuits. He is also an inventor, with 45 U.S. and 27 international patents and applications, and a co-inventor of the Hf-based, high-k gate dielectric materials currently in use within the semiconductor industry for advanced high-performance logic in microprocessors, according to the Wallace Group at UT Dallas. This entry was posted in Events, IMR Colloquia, News and tagged Distinguished Lecturer Series, IMR, Robert M. Wallace by mhuson. Bookmark the permalink.